We urgently require another V12 E type roadster for a client who narrowly missed this car. In Azure Blue with with Cinnamon trim. Registered in the UK in 1974, this superb Series 3 E type roadster was supplied new to the Levy family in London. They kept the Jaguar until 1984 by which time it had covered 19,700 miles. It was sold to a Swiss businessman based in Zurich who then emigrated to New York and took his E type with him. He owned the car for thirty years and drove just over 7,000 miles in that time. The E type is a UK supplied, right hand drive car and the Heritage Certificate in the file confirms that this is a matching numbers example. Whilst in the US, the Swiss owner had it converted to a four speed manual using an original Jaguar conversion from the UK as he had always felt that the car should have been so equipped. In 2014 the Jaguar came to the UK and has had one local owner since. 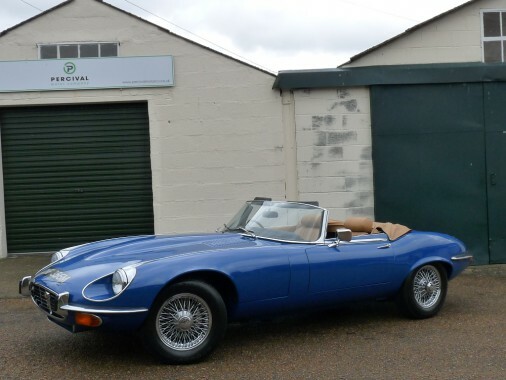 It was serviced and fettled on arrival and then received a thorough going over at an E type specialists last summer (2016) which came to £6,000 and included lots of detailed work to make sure that everything worked correctly. The original paintwork was fading and had some spidering so a complete bare metal repaint was carried out in early 2016. No corrosion was found and no bodywork rectification was necessary. The underside has never had any repairs. The total mileage of the car is now 27,600 miles with its three owners. This E type drives beautifully and feels very powerful. It accelerates strongly and cleanly, the suspension is tight and quiet and the brakes and steering are smooth and clunk free. The car remains standard with only the addition the manual gearbox to enhance its specification.